Quickly becoming one of the top middle distance runners in the world David Krummenacker beat a world-class field at the 2002 Oregon Track Classic running the fastest 1000 meters on US soil by an American. Additional big wins this year at the adidas Boston Indoor Games - where he set an American indoor record in the 1000 meters - and the Millrose Games prove he is among the best in the world. Since the age of five years old through eighth grade David Krummenacker can't remember a day going by without playing with a soccer ball. It was his first love. But when the coach made him leave his favorite forward position to play goalie he didn't like it anymore because he couldn't run as much. It was his second love, basketball, which made him discover his talent in running. David's first experience with competitive racing came when his basketball coach told him he had to get in shape by running cross country. He didn't like it much. Two years later he won the New Mexico State Cross Country Championship while running for Las Cruces High School. He capped off a great high school running career at the New Mexico State Outdoor Track & Field Championship winning the 800 and Mile in 1:51.7 and 4:16.6 respectively. 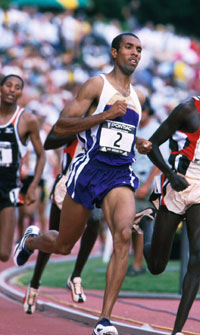 David continued his running at Georgia Tech where he won two indoor NCAA 800-meter championships. David resides in Atlanta, GA, however he trains in Tucson, AZ for much of the year.